Volvo Trucks is now taking yet another important step in the development of autonomous vehicles. The aim is to examine how this technology can contribute to safe and productive transports in tough geographically-limited application areas. 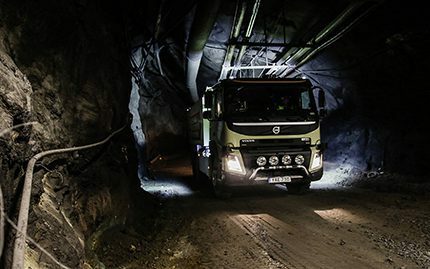 Over the next year and a half, self-driving autonomous Volvo FMX trucks will be tested in regular operations in the Boliden mine in Kristineberg, Sweden. “Through our co-operation with Boliden, the development of autonomous vehicles is entering an exciting new phase,” explained explains Claes Nilsson, president Volvo Trucks. When Volvo trucks pulled the wraps off its autonomous Volvo FMX earlier this year, it attracted considerable interest in the industry. The research and development project of which this truck is a part reveals that self-driving trucks may offer a significant contribution to increased transport efficiency and productivity. For example, ports, mines and other geographically-limited and well-controlled environments with a large proportion of regular, repetitive driving. “This is the world’s first fully self-driving truck to operate under such tough conditions,” says Torbjörn Holmström, member of the Volvo Group Executive Board and Volvo Group chief technology officer.